Rajput Jain & Associates offers the quickest and easiest Income Tax Return e-Filing solution for Investor individuals. You will have to mail the scanned copies of your documents to Rajput Jain & Associates the photocopies of these documents can also be submitted at Rajput Jain & Associates help desks and our expert team of chartered accountants takes care of the rest. Investor e-File Starter is a basic starter plan for Individuals a plan for individual investors who are interested in self-preparing and e-filing verified tax returns.With Investor e-File plus you can file your verified ITR1 or ITR2 within 10 minutes through authorized e-return intermediary. Verification of ITR data with the Form 26AS data in the Income Tax Department's database. Facility to upload any number of transaction statements from brokerages for automatic computation of capital gains. Preparing & Review income tax returns with the help of a tax professional. Posting the review by the tax professional, (In this process, a checklist will be emailed to you along with your Draft ITR. Once you confirm this over an email, your return will be e-filed). Depositing signed ITR-V to CPC (if drop-box facility is availed by your employer). Your draft ITR would be created within 72 hours of receipt of your documents. Your ITR will be e-Filed within 72 minutes of your clicking ‘e-File My Return’ Button. Your ITR-V will be uploaded in your user account within 72 minutes of your clicking ‘e-File My Return’ Button. Your signed ITR-V will be deposited to CPC within 3 days of drop-box clearance (Only applicable for users whose employer has opted for the drop-box facility). Investor e-File plus is for those taxpayers who invested in shares/derivatives/mutual funds Willing to be assured that your stock / MF / derivative transactions are being used accurately with to ensure minimal tax outgo, who are interested in self-preparing and e-filing verified tax returns. But also who would also like the assistance of a tax professional to enter their data and review it for themin your ITR in compute tax returns. A full feature online application for self-preparation of ITR (ITR1 and ITR2) and e-Filing of ITR. Preparing income tax returns with the help of a tax professional. Facility to track the ITR-V status. Service to deposit your signed ITR-V with the CPC. (Only applicable for users whose employer has opted for the drop-box facility). Your draft ITR would be created within 48 hours of receipt of your documents. Your ITR will be e-Filed within 45 minutes of your clicking ‘e-File My Return’ Button. Your ITR-V will be uploaded in your user account within 60 minutes of your clicking ‘e-File My Return’ Button. Your signed ITR-V will be deposited to CPC within 2 days of drop-box clearance (Only applicable for users whose employer has opted for the drop-box facility). Investor e-File premium is also aimed at those taxpayers who like peace of mind throughout the year and would like to stay prepared for any notice (s) from the I-T department., in case of scrutiny assessment, along with e-filing tax returns. An online solution that Round-the-year access to a Chartered Accountant, who further customizes these options for you and also answers any specific tax query that is provide more tax-efficient options. Professional preparation and e-filing tax returns (including e-file by email or e-file by payroll portal). Chartered accountant available for the entire year. An online vault to save your tax documents for scrutiny or reference. Automatic tracking of income tax assessment order. Sending reminder notifications via email. Your draft ITR would be created within 30 hours of receipt of your documents. Your ITR will be e-Filed within 30 minutes of your clicking ‘e-File My Return’ Button. Your ITR-V will be uploaded in your user account within 45 minutes of your clicking ‘e-File My Return’ Button. Your signed ITR-V will be deposited to CPC within 2 days of drop-box clearance (Only applicable for users whose empoyer has opted for the drop-box facility). Your documents will be safely archived for 8 years (or more). 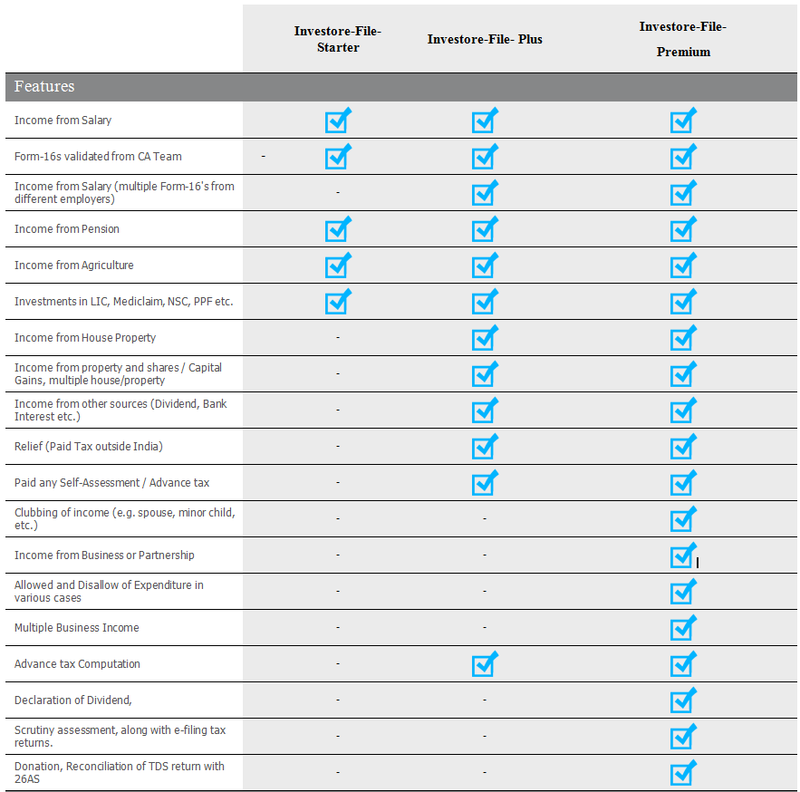 Investor e-File Premium has all the benefits of e-File packages. Not only you get access to an expert CA, other add-on feature of this package is tracking of your refunds and tax assessment order. A complete tax file is maintained containing your tax returns, Another add-on feature of this package is tracking of your refunds and notices, tax assessment order, and all related supports. While you retain the option to self-prepare your ITR, a ‘real’ tax professional will create your ITR based on the documents provided by you. To opt for this feature, you will have to mail the scanned copies of your documents to Rajput Jain & Associates the photocopies of these documents can also be submitted at Rajput Jain & Associates help desks (Applicable only at select employer locations). On receipt of the document, the assigned tax professional will get the data entry done for creation of the draft ITR. Once the ITR is ready, the tax professional would do a complete review the ITR for you so that you can e-File it without any doubt or hesitation! Apart from feeding in the data from your Form 16, the package also allows you to enter other details like income from any sources, income from house/property, capital gains, deductions, etc. Once you have created your ITR, the system automatically tabulates your tax liability, if any, and allows you to e-File your return through a single click! Rajput Jain & Associates Investor e-File- Starter is best suited for individuals having only Salary income. You should not use Investor e-File Starter if you have income from speculation business, or agriculture, or previous year loss to be adjusted. In such cases, we recommend you to select and our experts will prepare the return for you. Rajput Jain & Associates Investor e-File- Plus is best suited for individuals having income from multiple employers, income from House Property and income from other sources (Dividend, Bank Interest etc.). Rajput Jain & Associates Investor e-File-Premium is best suited for individuals having income from Business or Partnership firms. And Business e-File Premium has all the benefits of Investor e-File Starter and Investor e-File plus. Another add-on feature of this package is tracking of your refunds and tax assessment order, Scrutiny assessment, along with e-filing tax returns. we double check investor income tax return to make sure its done right and you get maximum tax refund. Rajput Jain & Associates has been designed keeping in mind the hassles an individual usually has to go through while filing Investor Income Tax Returns every year. At Rajput Jain & Associates we prepare your Income Tax Returns manually as well as through online software, which guarantees us 100% accuracy. To file an ITR through Rajput Jain & Associates, NO accounting knowledge or financial background is required. An individual is only required to provide us his/her personal details and send required information for prepare ITR. The rest is taken care by our team of expert chartered accountants who prepare the Tax Returns and then file it with the Income Tax Department. Once prepared each ITR is verified twice by our most senior chartered accountants to eliminate human errors if any. Finally the tax return is electronically filed with the Income Tax Department and an Acknowledgement is e-mailed back to the user. Copy of your PAN Card. Form 16 - received from your employer. Form 16A - for any Income other than salary (if available). Bank Interest (Interest uptoRs 10,000 from saving bank is exempt from tax u/s 80TTA). Bank Statement (Only for Business Enterprenours). We will check your form 26AS and check if any TDS is reflecting or not. We will advise you on Income tax Refund or payable Amount. We will guide you about the best possibilities to take Income Tax exemptions and Save Taxes. We will file your Income tax Return and mail you the acknowledgement. 4.) What steps are to be followed when I e-File without using a Digital Signature? Do not fold this signed ITR-V. Enclose the same in A-4 size envelope. 5.) Income Tax Department CPC Post Box No.1, Electronic City Post Office, Bangalore 560100, Karnataka. Upon receipt of ITR-V, Income Tax Department will send an e-mail acknowledging the receipt of signed copy of ITR-V. This is your acknowledgement. Your filing is now complete. 6.) Is there any time limit for submitting ITR-V to Income Tax Department? 7.) Does that mean that I cannot file return after the last date mentioned? Further, in case you have still missed to file your Income Tax Return by 31st March, 2016, you can still file the same till 31st March 2016, beyond which the return will become time barred and you would not be able to file the same. Assessing Officer may require you to pay penalty up to Rs.10,000 for late filing of Income Tax Return. 8.) What is Revised Return and can I file a Revised Return using Rajput Jain & Associates? 9.) Whom should I contact in case I have queries / difficulties? Rajput Jain & Associate’s Customer Support team will be happy to help resolve all your doubts and queries.